Yes, I've been remiss in recent weeks, giving you a noticeable dearth of new blog entries. I want to begin blogging every day I can so I can bring you guys (and gals) as many new insights as I'm able. That'll mean retrospectives, interviews, and spotlights on some rare comics you just won't see on these shores (and that's a major hint to at least one new feature!). I went back to Pittsburgh, my hometown, and attended the Pittsburgh Comicon, getting about eleven sketches (that you'll see soon, both here and at my Comic Art Fans page) and buying a few unusual items. I've also catalogued more of my collection that remains on the east coast, and soon I'll be putting those books on eBay (or, if anyone wants to give me offers here, feel free!). Now then, what've we got today? Since I haven't blogged on them during the last couple weeks, I figured I'd take time out today before any more issues hit to review three books. They won't be my usual in-depth reviews since I'm squeezing three issues into one entry, but you'll get the idea. As in my last round of quick reviews, these ones will be summed up with four main classifications you can easily make sense of: Buy It (highly recommended), Read It (recommended), Skip It (unless it's a light week...), Burn It (a very special kind of hell). This is a well-oiled, gamma-irradiated engine of storytelling, and it just might challenge Roger Stern & Sal Buscema's "They Who Wield Power" arc in the 80s for best Tyrannus story. Cheap hype? Perhaps. Regardless, this book was a treat after the darkness of "Planet Savage," brought to vivid life with Pak's knack for clever dialogue and Grummett's superb superheroic art. It's a fun, fun bit before the emotional torture that's sure to come in "Heart of the Monster." Simply put, Buy It. Skaar's second go-round at a solo title continues, with the Son of Hulk involved inconsequentially in a battle with "Kirby Kreations" Moonboy and Devil Dinosaur, while the real action occurs in the tribal council of the Savage Land, where a possessed Shanna sheds blood and turns the tribes against Ka-Zar. A few short weeks ago, I lauded Rob Williams and Brian Ching's efforts on the first issue of this title, overlooking the unusual nature of the "tribal council" where Ka-Zar addressed the people while wearing a business suit. Obviously, it is writer Williams' effort to establish a dichotomy between the Savage Land's name and what it has become, making Ka-Zar out to be too wrapped up in the ways of more developed countries to be a suitable leader. That point is doubly the thrust of the Designer, who has possessed Shanna. The comparison doesn't quite work when you consider the Savage Land's history and that this series marks the first occasion for the tribal council to be presented thusly. This issue downplays Skaar's involvement, which is unusual considering his name's on the cover, and the lion's share of the narrative involves Ka-Zar and the Designer/Shanna. Now, it looks like Skaar will again be near the center of events with the next issue, as he's poised to attempt a rescue of his fellow Sakaarians (mentioned in this issue at last) from the Designer's, um, designs. 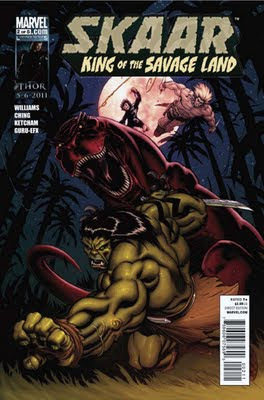 As it is, in spite of the continual lush artwork by Brian Ching, Williams' Skaar is a weak leading man. I hope that changes, and very soon, because the character, who's been well-developed under Greg Pak, risks being trampled by the grandoise narrative around him. Sadly, my concerns from the first issue, amplified through this issue's events, force me to downgrade my opinion. For now, you should definitely Skip It. It's been fascinating stuff during these last several months since Jeff Parker and Gabriel Hardman attained control of the Scarlet Smasher's book. Parker brings old-school sensibilities to the book, effortlessly weaving sub-plots through the main story and through the recently-finished series of back-up tales. 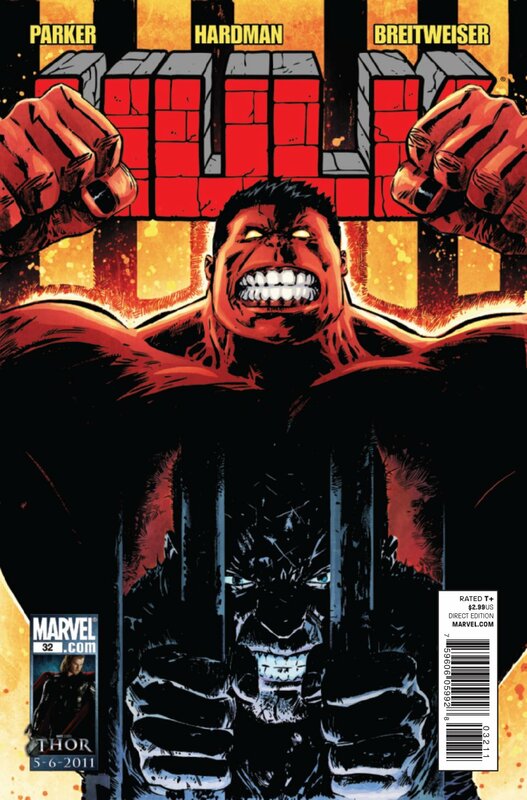 Several of those elements are going to come to a head next month, where if the cover's any indication, the Red Hulk will face four new foes, the final of which Parker introduces this month in Black Fog. 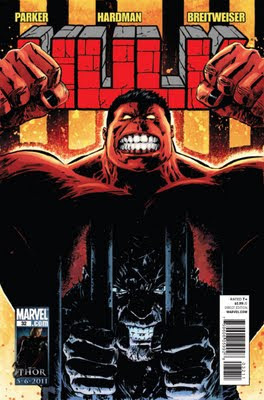 Speaking of the Red Hulk, this month's adventure for him amounts to little more than reminding readers of his ongoing troubles with General Fortean (with, don't get me wrong, a terrific dream sequence as drawn by Hardman) and giving him an unremarkable foe to fight in the form of...a tornado. In virtually all ways, the storyline echoes every old Len Wein/Herb Trimpe story where the Hulk was on the run from the military, wandering into some small town and helping them against some nebulous menace. In this, Parker only succeeds in marking time--dynamically illustrated time, as is always the case when Hardman and Breitweiser are involved, but time nonetheless. He is much more successful in the other storyline in this issue, the origin of Black Fog, a serial killer endowed with superhuman abilities by Zero/One. Zero/One's childhood memories of the killer as a "boogeyman" become chilling reality thanks to her new power. His transformation is an excellent centerpiece, and I'm intrigued to see just where the character goes from here. I just hope there's time to examine his state of mind with the grand conclusion impending next month. 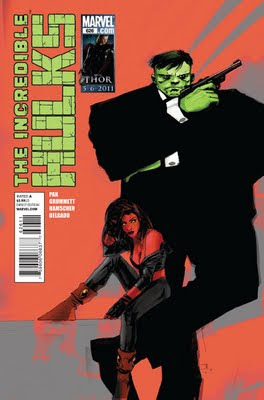 Truly, his is an excellent lead-up, but add in the less-than-incredible Red Hulk plot means you should just Read It. Next: Firestorm? The Crossing? More fun with the Hulk family? A convention sketch? Or something totally different, yes? Just wait! I mostly agree with you, however I liked the second issue of the Skaar mini series more than you. I also hoped you would mention how similar the device in Pak's last story are with the ones we saw in the They who wield power Tyrranus story line you mentioned. And has Pak mentioned any plans to reveal the origins of either the Red Imperials and/or the Shadow People who are not natives to the planet Skaar? There is another important question that came to my mind. At the end of Dark Son we learned that Hiro really did not talk to his mother. However the spirit of his mother does exist and she sent Skaar to earth. Is Pak planning on dealing with this? Will we see her again and if so will she meet Skaar or the Hulk? So Skaar was visited by Caiera, irrefutably, but Hiro-Kala was only using his powers to conjure the image of his mother in #13-on. I'm not seeing a problem. I think it was conclusively stated that Caiera's spirit was in Sakaar, and with the destruction of the planet, that spirit is dispersed. I also don't imagine we'll get any more word about the origin of the Imperials or the Shadow People more than we've already seen in the PLANET HULK GLADIATOR GUIDEBOOK & the end of SKAAR #12. It just doesn't seem important to the thrust of the current arc. There are bigger fish to fry. The "They" device I don't think is in any way related to the "Planet Savage" arc. It's a picayune piece of continuity and really just a coincidence. You're searching for connections that just aren't there. Gary I think you misunderstood me. I know there is not a contradiction. What I was asking is do you think maybe we will her again before Pak's run is over? On the final two points you are most likely right. It would be too bad because the origin of either race would make a interesting story. The shadow people might show up in Jeff Parker's next story arc so maybe he will give them a origin. Who knows.